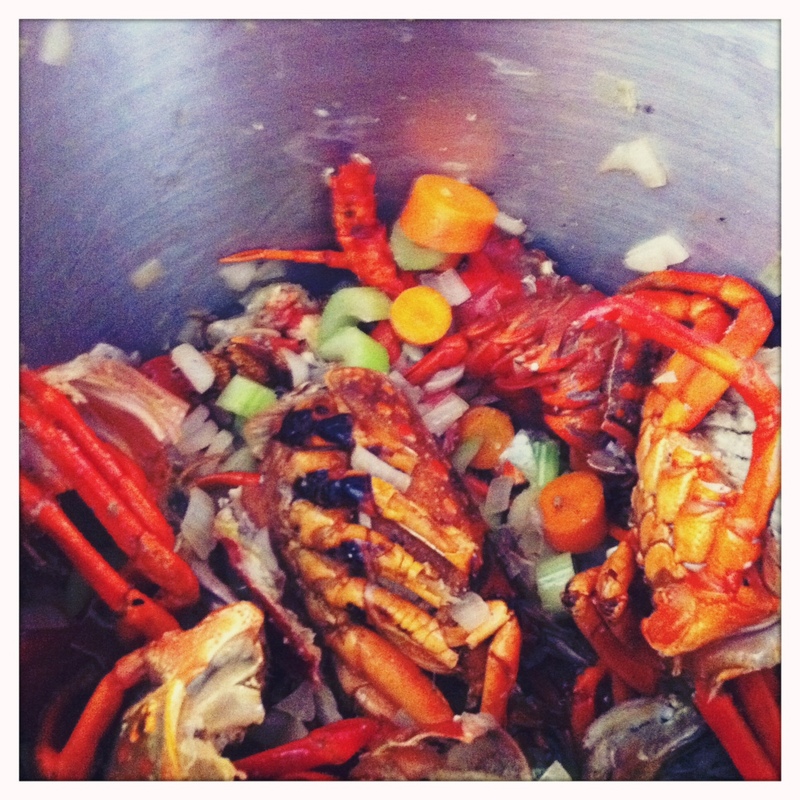 lobster stock: what to do with it? 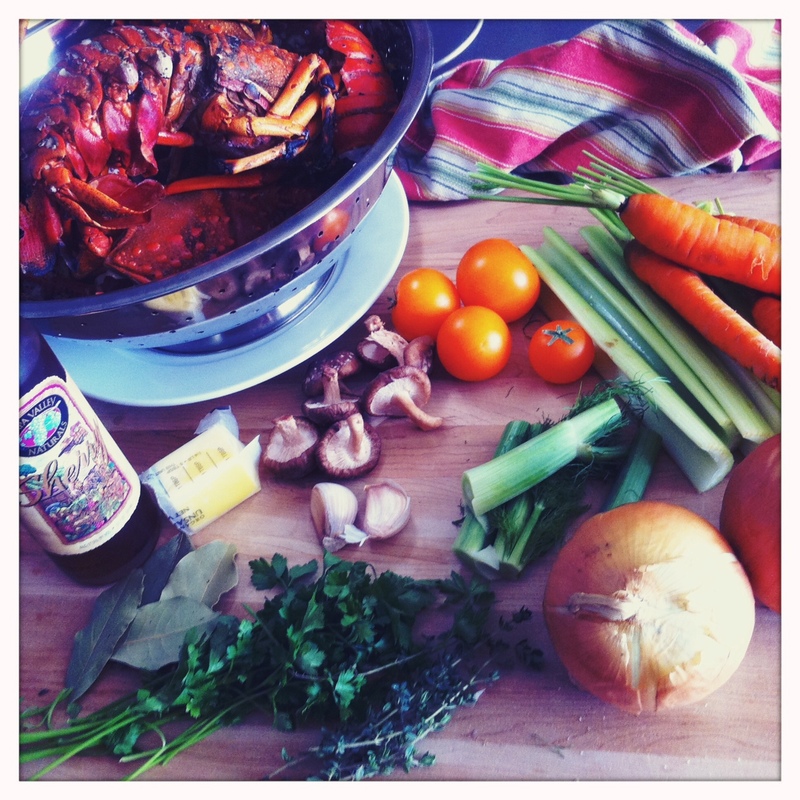 i had never made a lobster stock before, so i started with the fish stock recipe from the weston a. price foundation article ‘broth is beautiful’ and added in a few things of my own. note: if your lobsters were grilled, clean the shells of any excessively charred parts. 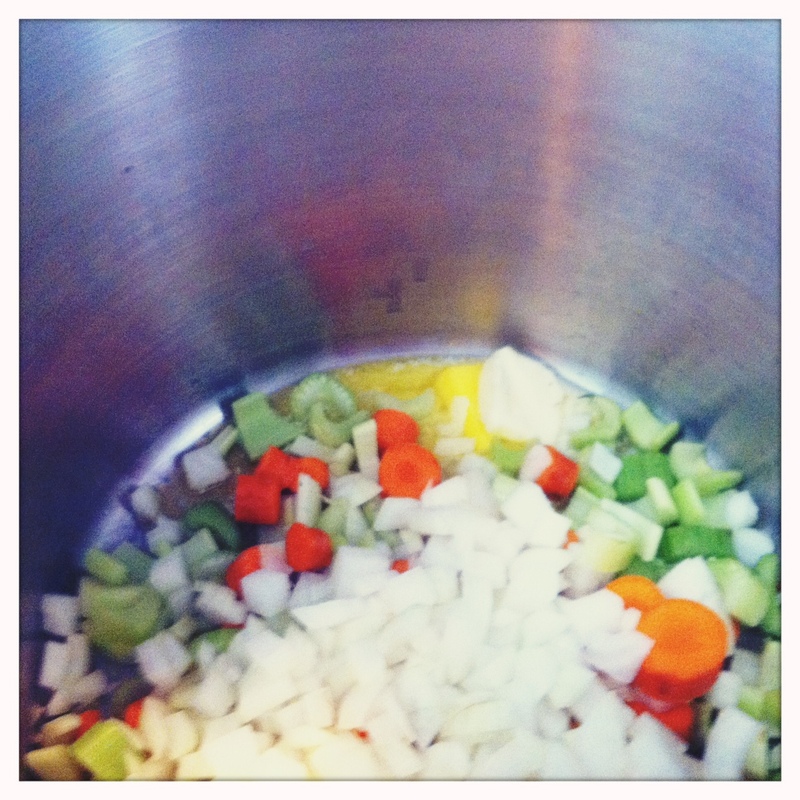 melt the butter in a large stock pot with the onions, carrots, celery, and fennel. 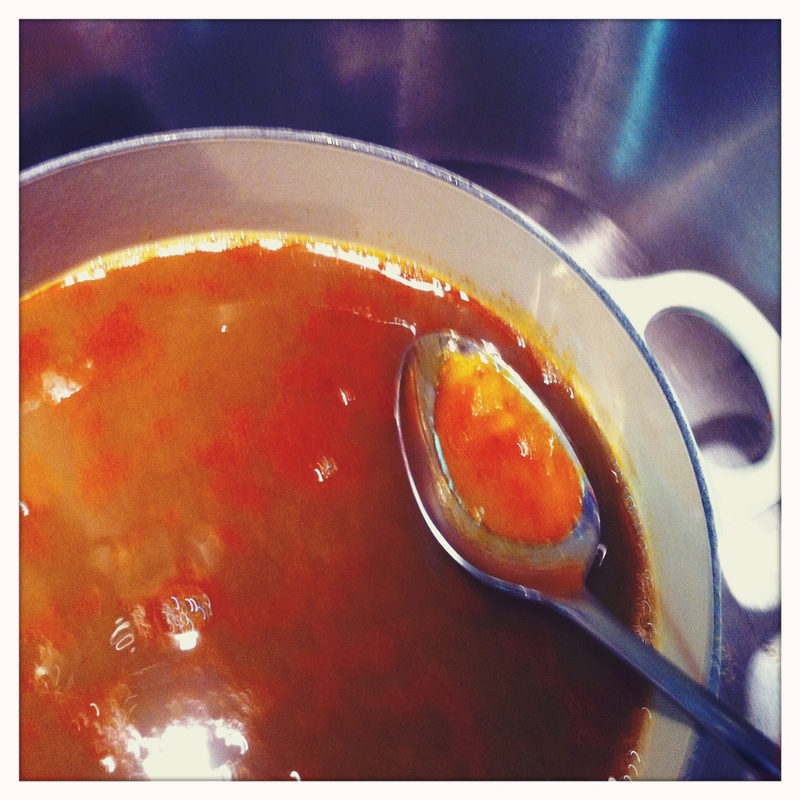 cook until softened a bit. 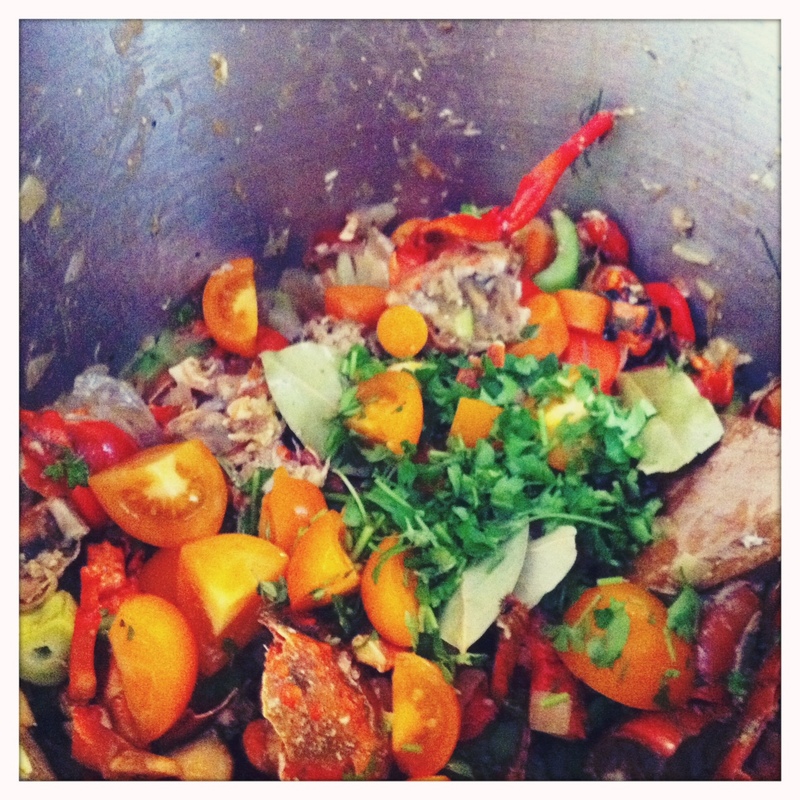 add the tomatoes, mushrooms, parsley, thyme, bay, garlic and lobster shells. toss with softened veggies. add sherry and wine and let cook for about 5 minutes. 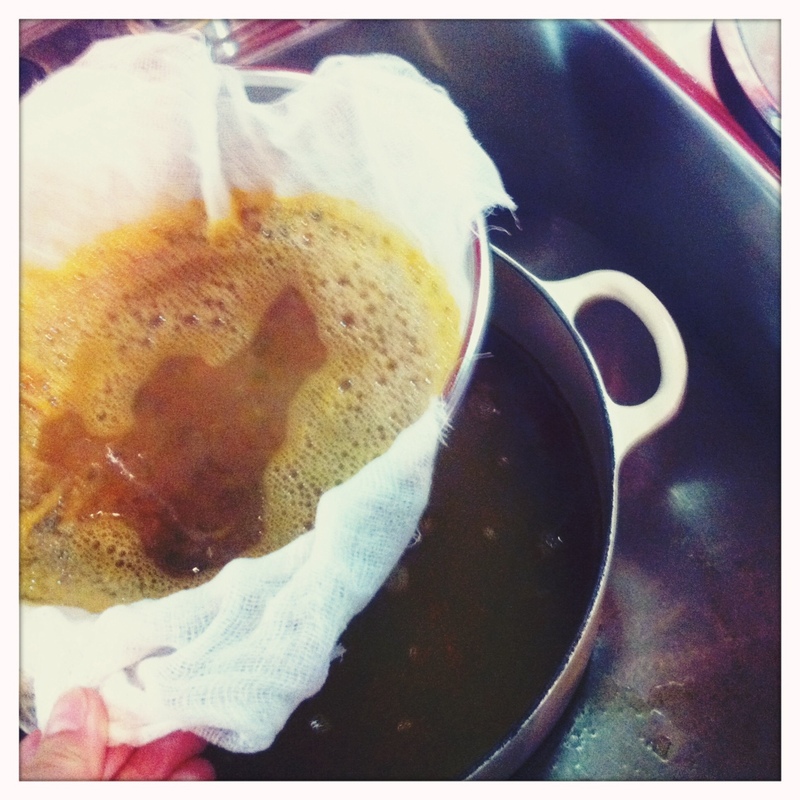 cover with cold filtered water, add salt and pepper, and bring to a boil. 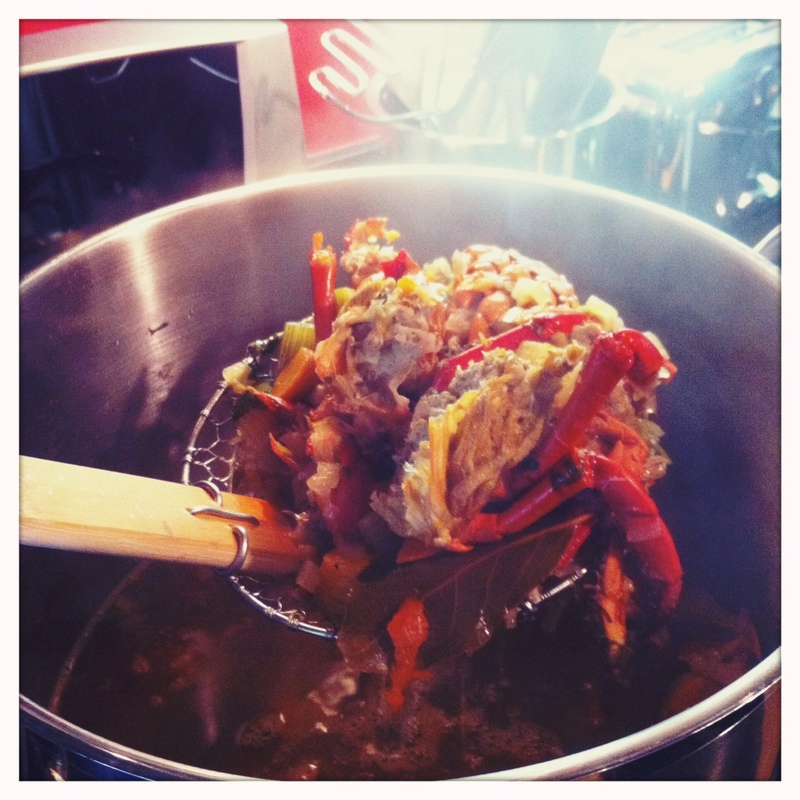 reduce heat to a simmer for 2-3 hours. using a slotted spoon discard the largest pieces of shell. 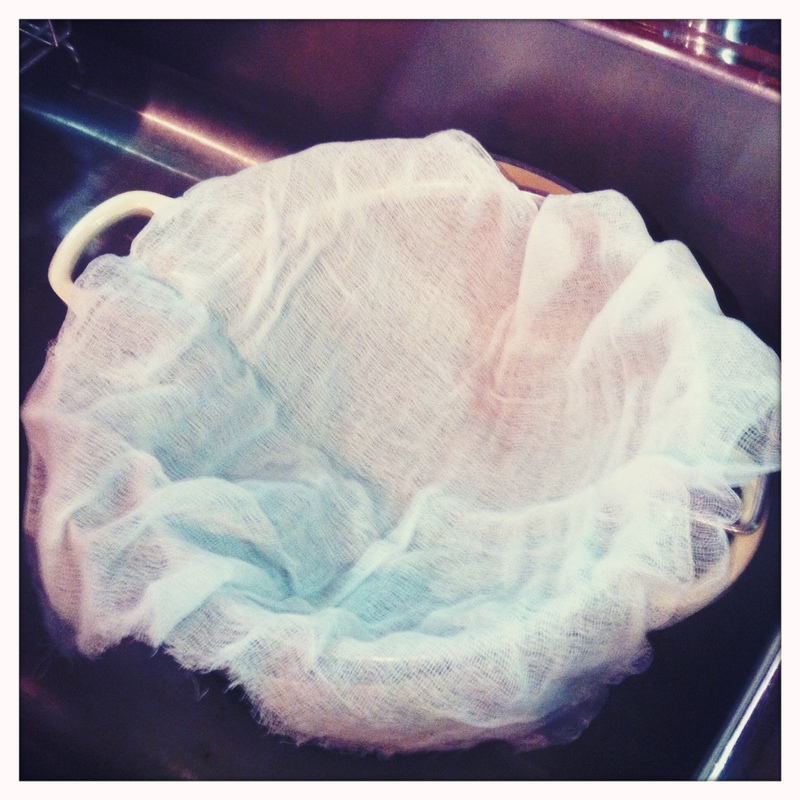 then pour the rest through some cheese cloth lining a colander or mesh strainer. press down on the bits to exude any remaining juices. chill overnight in the fridge. skim any fat off the top. divide broth into different sized plastic containers in order to freeze and use in the future. …but since then i had the pleasure of having tom colicchio‘s version at craftsteak in las vegas, and i am now on a mission to recreate his. so, until then i’m not going to waste your time with my recipe when i know there is a better one out there…and by better, i mean absolute perfection and fantastic. i would be ashamed and embarrassed to post my meager recipe. 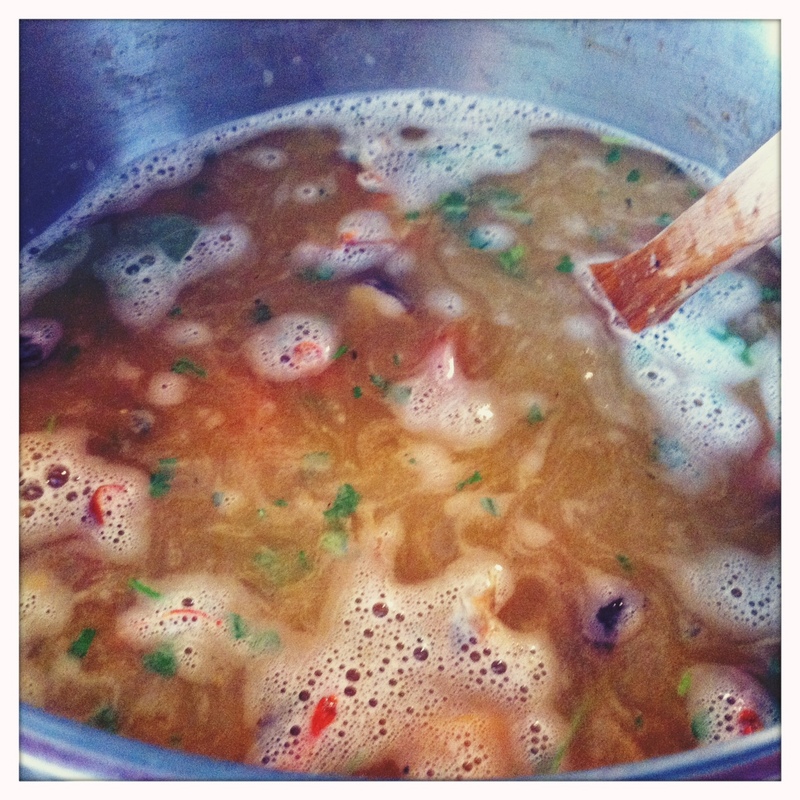 i did make a thai-style soup recently, inspired by my fellow food blogging friend spencer h. gray’s post on his blog omnivorous, using lobster stock, baby bok choy and shrimp, plus many of the ingredients he has listed. 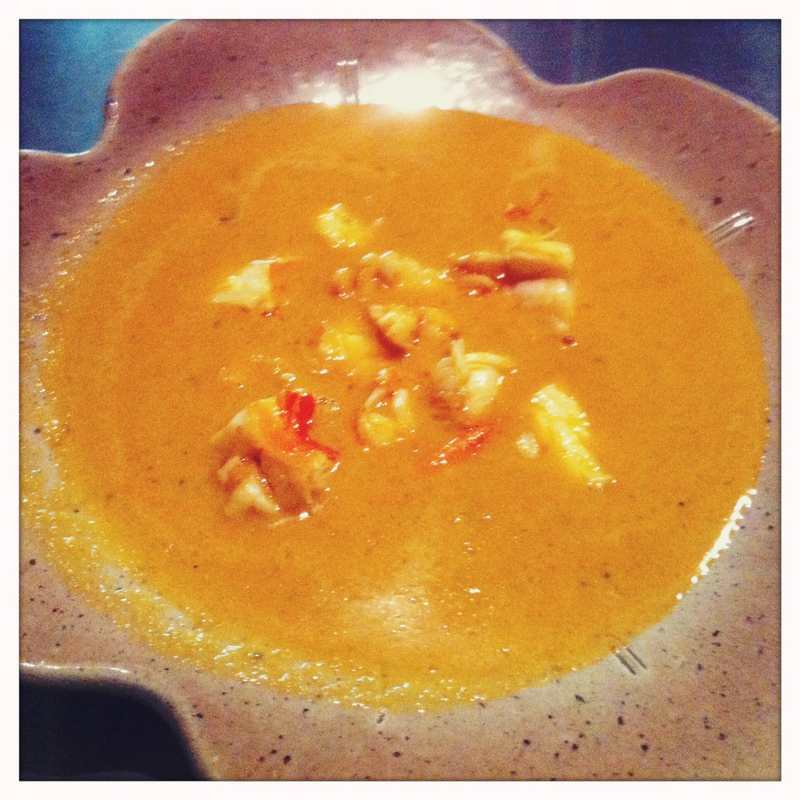 considering i have never made a risotto, why not try a bivalve risotto made with lobster stock? i’m thinking mussels and clams from the oyster boys at the hollywood farmers market are in my near future. note: since posting this i did make a wild mushroom risotto with lobster stock and it was lovely. although ’tis the season, this idea works well really for other occasions during the year such as birthdays and showers. for a bridal or wedding shower, it’s fun to contact some friends and family of the couple and ask them to send you their favorite recipes to add to the book. 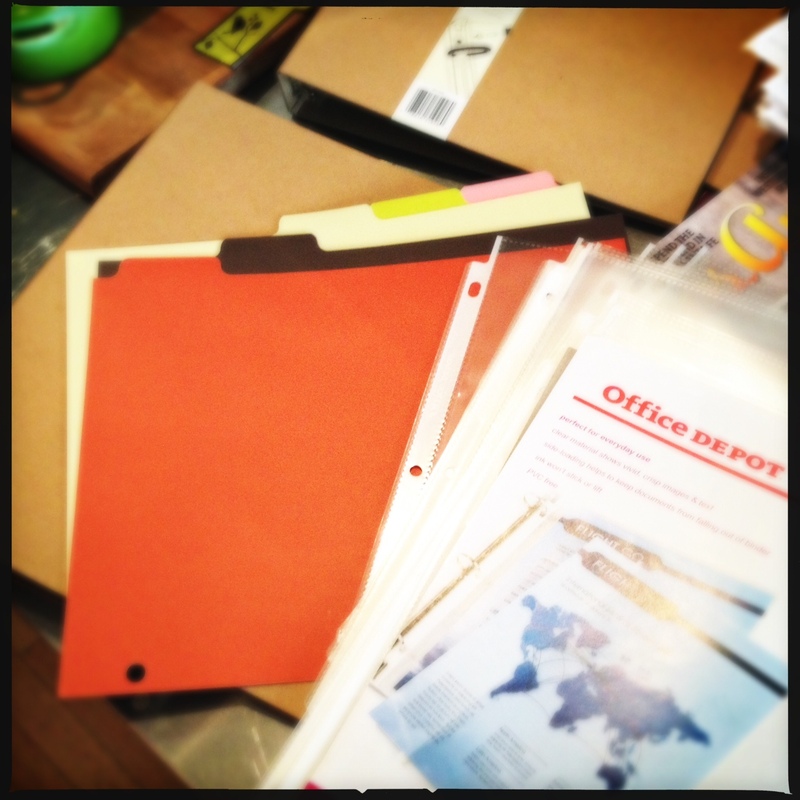 most office supply stores have nicer versions of the above supplies, so you can personalize it a bit. 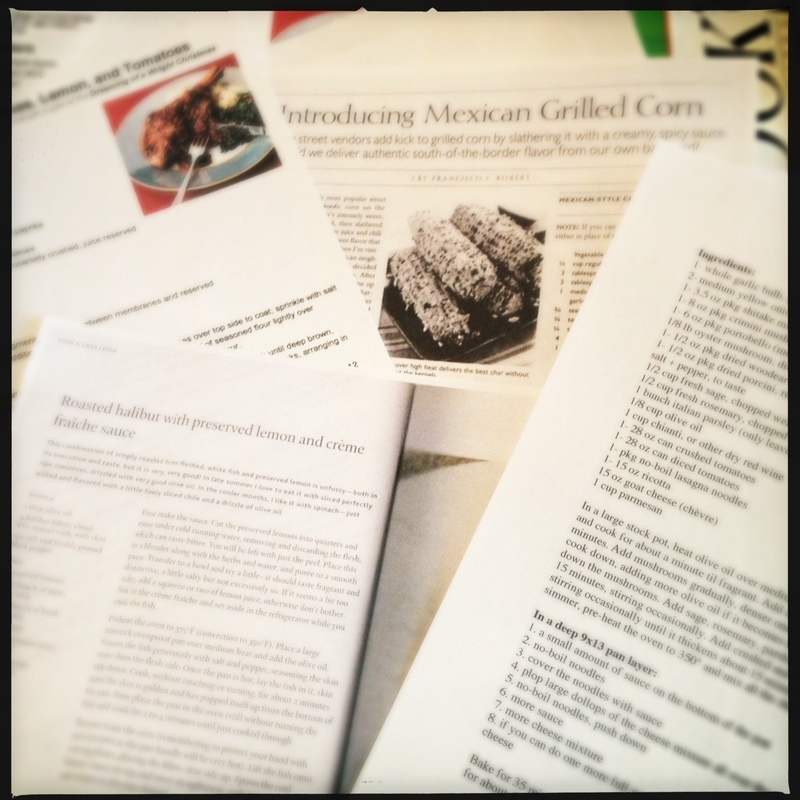 collect some of your favorite recipes and print them out on 8.5 x 11 sheets of paper. 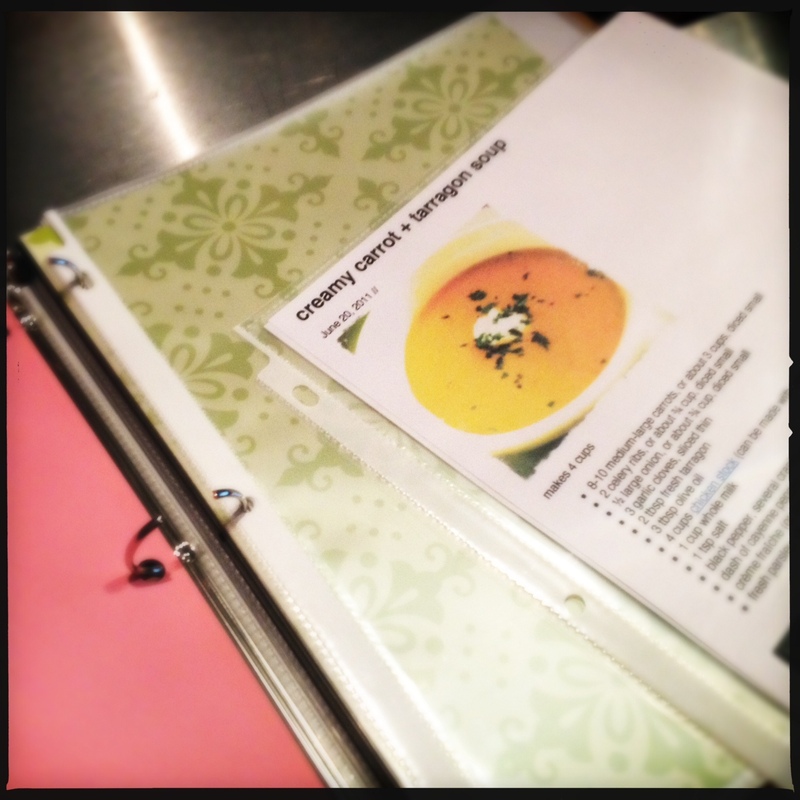 if you are able to print in color, it’s always nice to have a pretty picture along with the recipe. slide them in the clear sheet protectors. 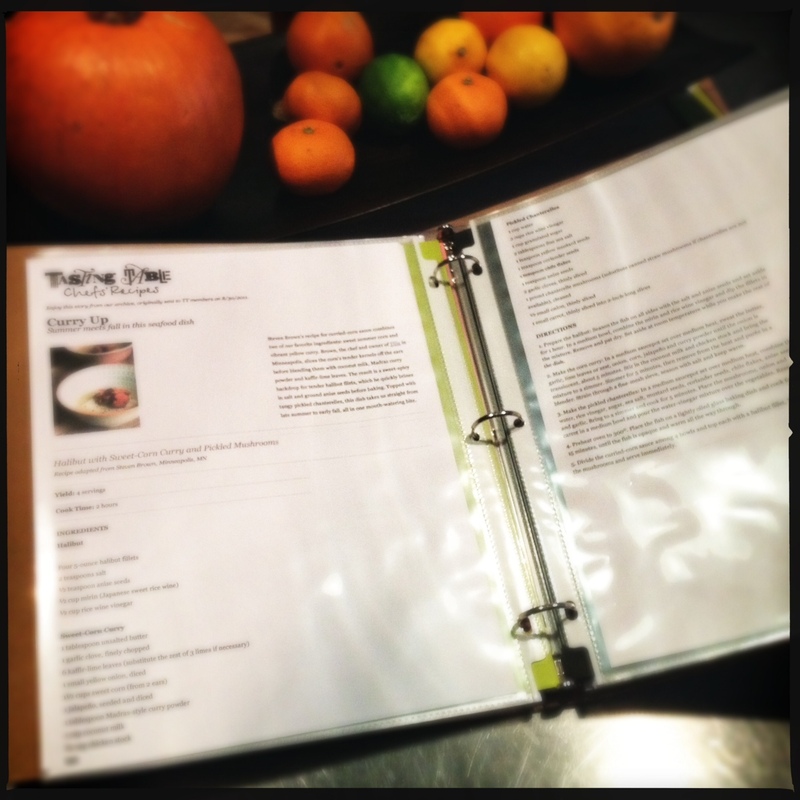 put a two-page recipe in front to back, so it is easy to click out of the book as needed. you can also arrange them on opposite pages so when the book lies open it is spread out or able to be put in a cookbook holder. the plastic has the added benefit of easy clean up to those chefs that tend to splatter about when cooking. label the tab dividers with categories such as main courses, sides, desserts, or beef, poultry, fish…however you want to separate the divisions. make sure to leave some of the sheet protectors empty so the receiver can add some of their own favorites. 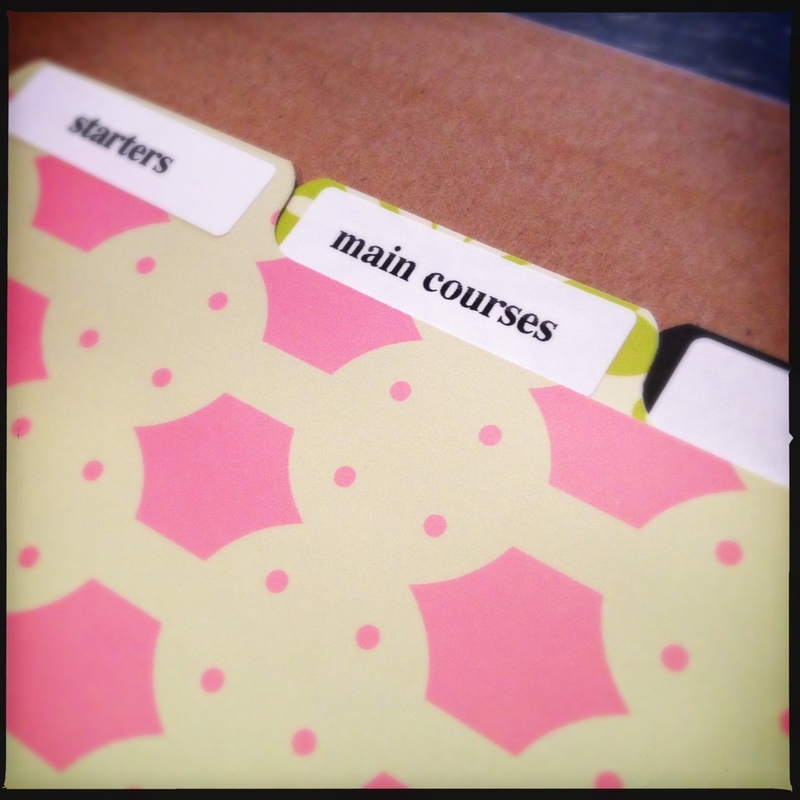 label the front, or if the binder has a slot to add a sheet of paper on the front, perhaps print out a pretty picture of food or get creative with a personal design. 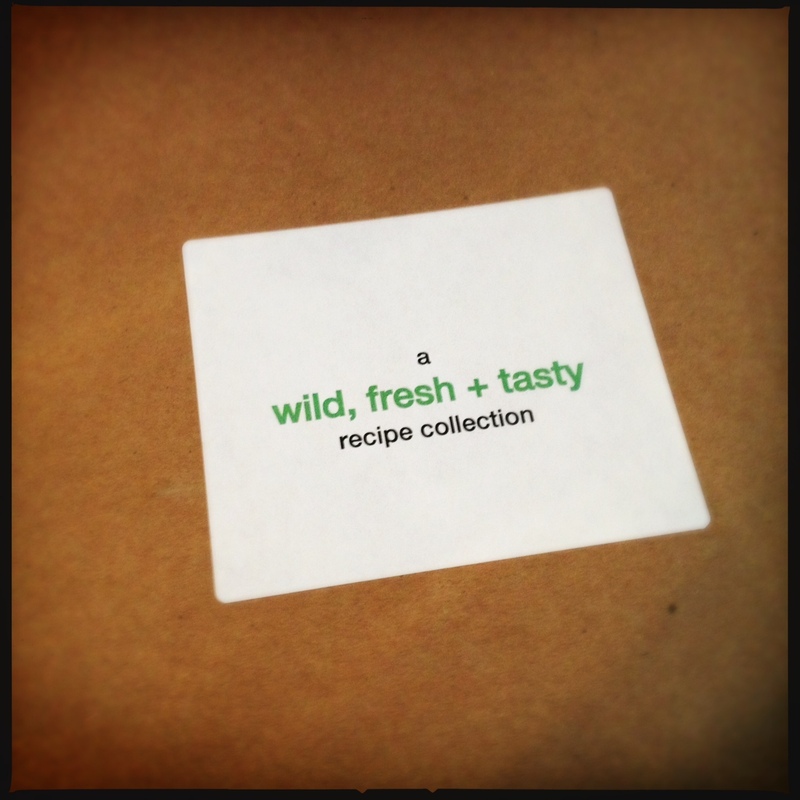 wishing you a very merry christmas, happy hanukkah, fantastic festivus, kickass kwanza, sunny solstice, and most of all a wild, fresh + tasty 2012!